Business challenges facing U.S. fashion companies: Protectionism is the top challenge for the U.S. fashion industry in 2018. More companies worry about increases in production or sourcing cost, too. 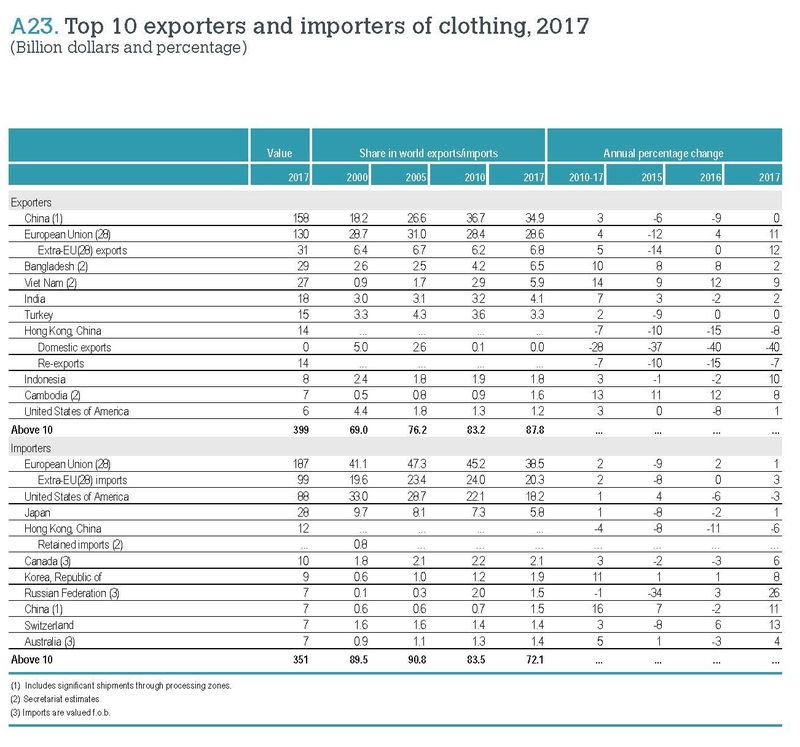 For the second year in a row, “protectionist trade policy agenda in the United States” ranks the top challenge for U.S. fashion companies in 2018. Industry outlook: Despite concerns about trade policy and cost, executives are more confident about the five-year outlook for the U.S. fashion industry in 2018 than they were a year ago, although confidence has not fully recovered to the level seen in 2015 and 2016. In addition, 100 percent of respondents say they plan to hire more employees in the next five years, compared with 80-85 percent in previous studies; market analysts, data scientists, sustainability/compliance related specialists or managers, and supply chain specialists are expected to be the most in-demand. U.S. fashion companies’ sourcing strategy: When it comes to sourcing, diversification is key for many companies. Most respondents continue to maintain a diverse sourcing base, with 60.7 percent currently sourcing from 10+ different countries or regions, up from 57.6 percent in 2017. Larger companies, in general, continue to be more diversified than smaller companies. Reflecting the U.S. fashion industry’s growing global reach, respondents report sourcing from as many as 51 countries or regions in 2018, the same as in 2017. Asia as a whole continues to take the lead as the dominant sourcing region. Meanwhile, with the growing importance of speed-to-market and flexibility, the Western Hemisphere is becoming an indispensable sourcing base. Keeping a relatively diverse sourcing base will remain a key element of U.S. fashion companies’ sourcing strategy. Nearly 80 percent of respondents plan to source from the same number of countries, or more countries, in the next two years. However, respondents are equally divided on whether to increase or decrease the number of suppliers they will work with. “China plus Vietnam plus Many” has become an ever more popular sourcing model among respondents. And this model is evolving as companies further diversify their China production. In particular, China now typically accounts for only 11-30 percent of companies’ total sourcing value or volume, compared with 30-50 percent in the past. Although China’s position as the top sourcing destination is unshakable, companies are actively seeking alternatives to “Made in China.” This does not seem to be due to concerns about cost, but rather the worries about the escalating U.S.-China trade tensions. 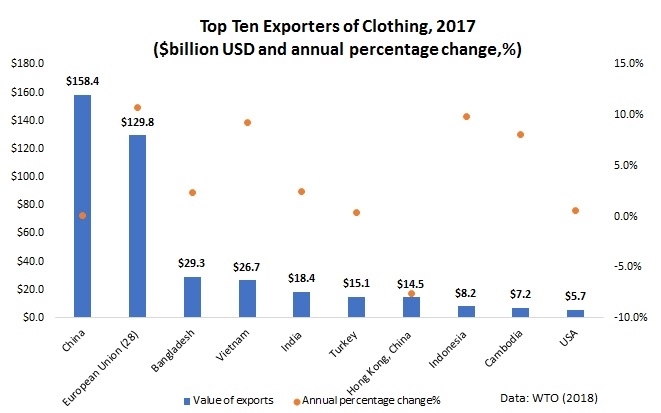 Benefiting from the diversification away from China, Vietnam and Bangladesh are expected to play a bigger role as apparel suppliers for the U.S. market in the near future. Rules of origin and the utilization of trade agreements for sourcing: Rules of origin, and exceptions to the rules of origin, significantly impact whether companies use free trade agreements (FTAs) and trade preference programs for sourcing. 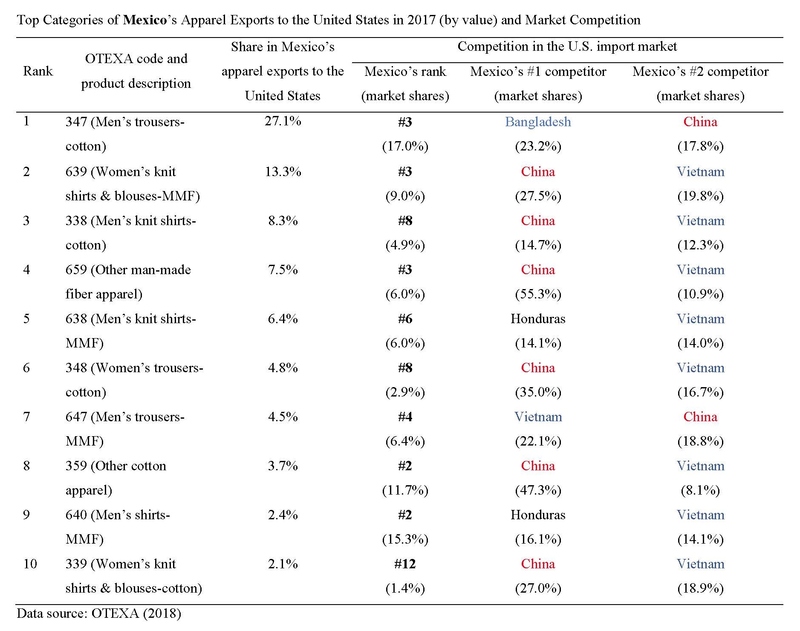 While FTAs and trade preference programs remain largely underutilized by U.S. fashion companies, more companies are using NAFTA (65 percent), CAFTA-DR (58 percent) and AGOA (50 percent) than in the past two years. Still, it’s concerning that companies often do not claim the duty-free benefits when sourcing from countries with FTAs or preference programs. Companies say this is primarily due to the strict rules of origin. Exceptions to the “yarn-forward” rules of origin, including tariff preference levels (TPLs), commercial availability/short supply lists, and cumulation, are priorities for respondents; 48 percent say they currently use these mechanisms for sourcing. These exceptions provide critical flexibilities that make companies more likely to use FTAs and source from FTA regions. 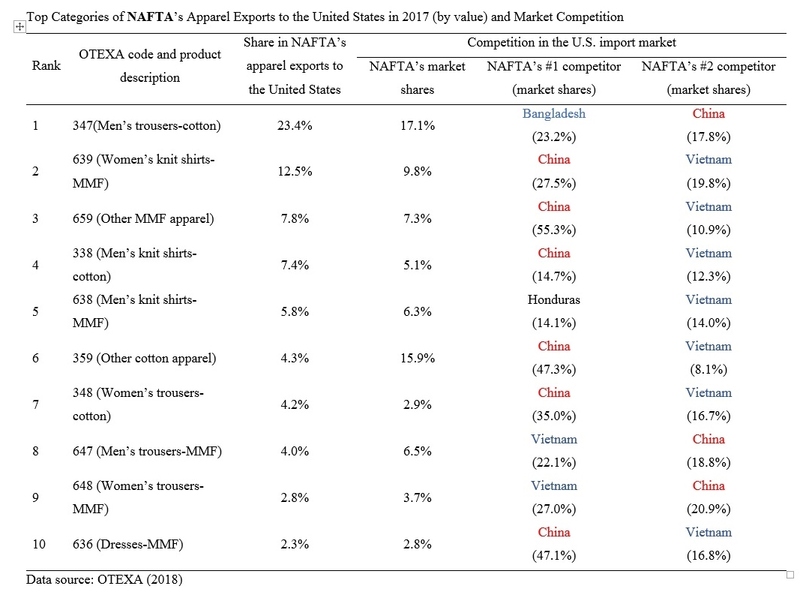 NAFTA: U.S. fashion companies call for a further reduction of trade barriers and urge trade negotiators to “do no harm” to NAFTA, the most-utilized free trade agreement by respondents. Respondents predominantly support initiatives to eliminate trade barriers of all kinds, from high tariffs to overcomplicated documentation requirements, to restrictive rules of origin in NAFTA and future free trade agreements. More than half of respondents explicitly say NAFTA is important to their business—and they have grave concerns about the uncertain future of the agreement. Sourcing in sustainable and socially compliant ways: Overall, U.S. fashion companies are making more commitments to sustainability and social responsibility. 85 percent of respondents plan to allocate more resources for sustainability and social compliance in the next two years, in areas including providing training to suppliers and internal employees, adding more employees, and working more closely with third-party certification programs on sustainability and social compliance. However, the availability of operational budget remains the primary hurdle for companies that want to do more. 100 percent of respondents map their supply chains (i.e., keep records of name, location, and function of suppliers), up from 90 percent in 2017. Over 80 percent of respondents track not only Tier 1 suppliers (i.e., factory where the final product is assembled), but also Tier 2 suppliers (i.e., subcontractors or major component suppliers, such as fabrics). However, it’s less common for companies to map Tier 3 (i.e., yarn spinners, finding and trimming suppliers) and Tier 4 suppliers (i.e., raw materials suppliers, such as cattle/pig hides, rubber, cotton, wool, goose down, minerals/metals and chemicals). 100 percent of respondents audit their suppliers for issues including building safety, fire safety, and treatment of workers. The vast majority of respondents (96 percent) currently use third-party certification programs to audit, with both announced and unannounced audits. On June 15, 2018, the Trump Administration announced to impose a 25% punitive tariff on a list of Chinese goods based on the results of its Section 301 investigation, which targeted against China’s unfair trade practices related to the forced transfer of American technology and intellectual property. The additional duty will first apply to 818 lines of products on July 6, 2018, which cover approximately $34 billion worth of imports from China. Office of the U.S. Trade Representative (USTR) said it would issue a final determination on the second set of 284 proposed tariff lines, which cover approximately $16 billion worth of imports from China shortly. 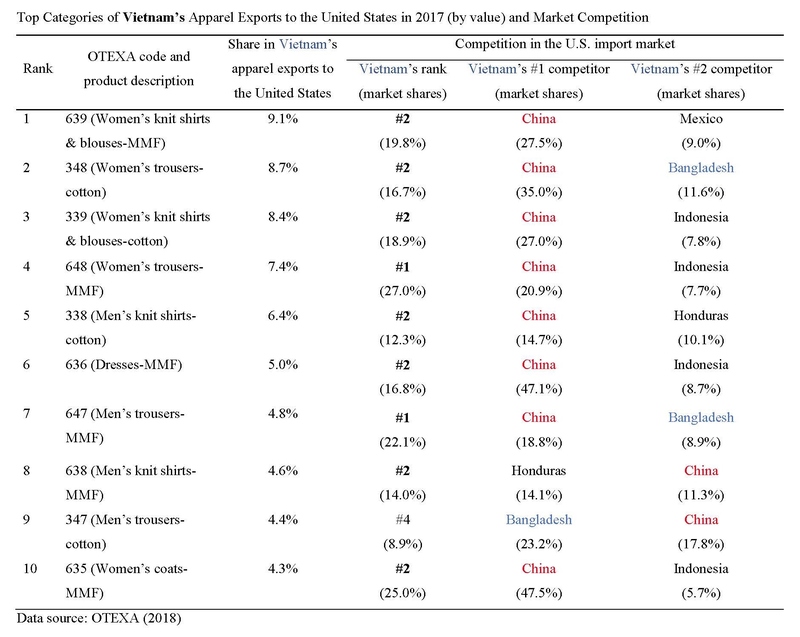 The total 1,102 tariff lines targeted by USTR generally focuses on products from industrial sectors that contribute to or benefit from the “Made in China 2025” industrial policy, which include industries such as aerospace, information and communications technology, robotics, industrial machinery, new materials, and automobiles. In response to the U.S. action, China’s Ministry of Commerce (MOFCOM) quickly announced its proposed countermeasures, including a 25% punitive tariff on approximately $34 billion worth of U.S. soybean, autos, and fruits effective July 6, 2018. China is also ready to impose the punitive tariff on another list of products, which cover approximately $16 billion worth of medical device, chemicals and energy imports from the United States. The U.S. textile and apparel industry keeps a close watch on the U.S.-China trade dispute since as much as 36% of U.S. textile and apparel imports come from China. In an announcement released on June 16, 2018, the American Apparel and Footwear Association (AAFA) called a victory that no textile and apparel products are subject to the punitive tariff proposed by USTR. The June 15 USTR list also removes the majority of the textile machinery initially on the retaliation product list back in April 2018. However, U.S. fashion brands and apparel retailers remain deeply concerned about Trump’s tariff action and its potential negative economic impacts on the apparel sector. In contrast, the U.S. textile industry, represented by the National Council of Textile Organizations (NCTO) praised the Trump administration’s tariff announcement. NCTO also called on the Trump administration to include finished textile and apparel products on any future lists of imports from China to be made subject to Section 301 tariffs. Not surprisingly, NCTO’s proposal is opposed strongly by AAFA and the U.S. Fashion Industry Association, representing U.S. fashion brands and apparel retailers. 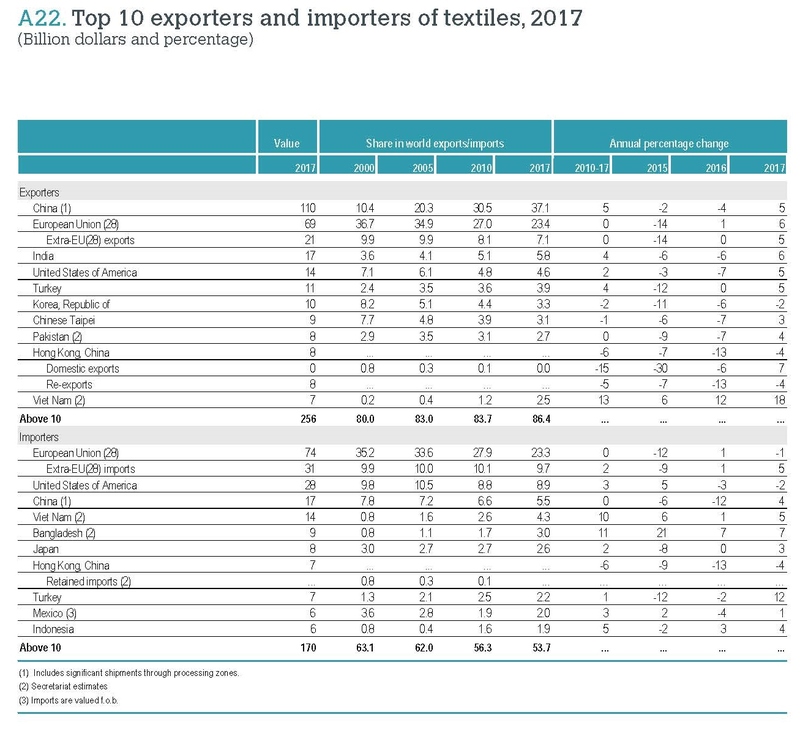 As argued by USFIA, the U.S. tariff rates on apparel and fashion products are already the highest among manufactured goods, reaching 32 percent for man-made fiber apparel and 67 percent for footwear. Any additional tariff would constitute a huge, regressive tax increase and have a negative impact on the American jobs. May 29, 2018: President Trump suddenly announced that the United States will impose a 25 percent tariff on $50 billion of goods imported from China containing industrially significant technology, including those related to the “Made in China 2025” program. The final list of covered imports will be announced by June 15, 2018. The announcement also said that the U.S. Trade Representative Office (USTR) will continue WTO dispute settlement against China originally initiated in March to address China’s discriminatory technology licensing requirements. Additionally, the United States will implement specific investment restrictions and enhanced export controls for Chinese persons and entities related to the acquisition of industrially significant technology. The list of restrictions and controls will be announced by June 30, 2018. May 19, 2018: A joint statement released by the White House said that the United States and China had led to an agreement for China to buy more goods and services, including “meaningful increases in U.S. agriculture and energy exports.” The statement also said that both sides attach importance to intellectual property protections, agreed to encourage two-way investment and to strive to create a fair, level playing field for competition, and agreed to engage at high levels on trade and investment issues. Additionally, the statement said that the United States would send a team to China to work out the details of the agreement. However, the statement did not contain a specific target for reducing the $375 billion trade deficits. April 5, 2018: President Trump announced that he has instructed the Office of the U.S. Trade Representative (USTR) to consider $100 billion additional retaliatory tariffs on China, in response to China’s own retaliation against the Section 301 tariffs announced in late March. In a statement released the next day, USTR confirms the proposed new measures. USTR also says that any additional tariffs proposed will be subject to a similar public comment process as the proposed tariffs announced on April 3, 2018. No tariffs will go into effect until the respective process is complete. April 3, 2018: USTR released the proposed list of Chinese products to be subject to the retaliatory tariff under the Section 301 action. The proposed list covers approximately 1,300 separate tariff lines and will undergo further review in a public notice and comment process, including a hearing (scheduled at around May 15, 2018). The USTR statement says it will make a final decision on whether to implement the proposed tariff action after the whole process. March 26, 2018: USTR filed a WTO case against China’s discriminatory technology licensing requirements (DS542). The US claimed that China’s measures appear to be inconsistent with Articles 3, 28.1(a) and (b) and 28.2 of the Trade-Related Intellectual Property Rights Agreement (TRIPS). As of April 8, 2018, the European Union, Japan, Ukraine and Saudi Arabia have requested to join the dispute as third parties. According to the WTO rule, China shall enter into consultation with the US no later than April 26, 2018. If the dispute is not resolved by May 25, 2018 (i.e., 60 days after the request for consultation), the United States may request a WTO panel. As of June 17, 2018, the case is still in consultations. March 22, 2018: President Trump announced his decisions on the actions the Administration will take in response to China’s unfair trade practices covered in the USTR Section 301 investigation of China’s Acts, Policies, and Practices Related to Technology Transfer, Intellectual Property, and Innovation. U.S. Trade Representative Robert Lighthizer initiated the investigation in August 2017 at the direction of President Trump. In the Memorandum he signed, President Trump directed the US Trade Representative to level tariffs on about $50 billion worth of Chinese imports. August 14, 2017: President Trump issued a memorandum directing the USTR to determine if China’s policies regarding IPR theft and forced technology requirements “may be harming American intellectual property rights, innovation, or technology development,” and thus warrant USTR action under Section 301of the 1974 Trade Act. On April 3, 2018, the U.S. Trade Representative Office (USTR) released the proposed list of Chinese products to be subject to the retaliatory tariff under the Section 301 action. The proposed list covers approximately 1,300 separate tariff lines, including textile machinery. However, textile and apparel (HS chapters 50 to 63) were not on the list. NCTO applauds the Trump Administration’s formal initiation of a Section 301 case designed to address China’s persistent and highly damaging actions in the area of intellectual property theft. NCTO argues that illegal activity on the part of the government of China has gone on for far too long, at the direct expense of U.S. manufacturers and the loss of millions of U.S. manufacturing jobs. The U.S. textile industry is severely disappointed that the retaliation list published by USTR on April 3 does not contain a single textile or apparel product. NCTO argues that China’s illegal IPR activities have damaged the U.S. textile industry and recommend that textile and apparel products be added to the retaliation list. USFIA opposes adding apparel (items classifiable under chapters 61 and 62 of the HTSUS) and other fashion products (such as footwear, handbags, and luggage) to the retaliation list against China. USFIA argues that tariffs are NOT the appropriate mechanism to redress the activities outlined in USTR’s report to the White House. Imposing tariffs on imports of fashion products would do nothing to solve the concerns about China’s IP policies and practices outlined in USTR’s Section 301 report. USFIA believes that the best way to address concerns about China’s IPR practices is action at the multilateral level that includes other US trading partners. AAFA strongly opposes the proposed imposition of tariffs on textile, apparel, and footwear equipment and machinery as this will result in increased costs for AAFA members who are making yarns, fabrics, clothes, and shoes in the United States. AAFA believes that a tariff on textile and apparel products would be a hidden tax on U.S. consumers, particularly since China represents such a large source of U.S. imports of these products. AAFA strongly supports the Trump Administration’s efforts to improve the protection of intellectual property rights in China. #1 How do rules of origin (RoO) and free trade agreement (FTA) regulations affect speed to market in apparel sourcing? Do countries who are part of an FTA find it to be easier to get to market in a shorter amount of time if they are working with other FTA members? Or could RoO slow down the production process because producers have to be more careful about compliance with the complicated RoO? #2 Why or why not the “yarn forward” rules of origin remains an effective way to promote textile and apparel production in the Western-Hemisphere? What other options are available to improve the competitiveness of the Western-Hemisphere textile and apparel supply chain? 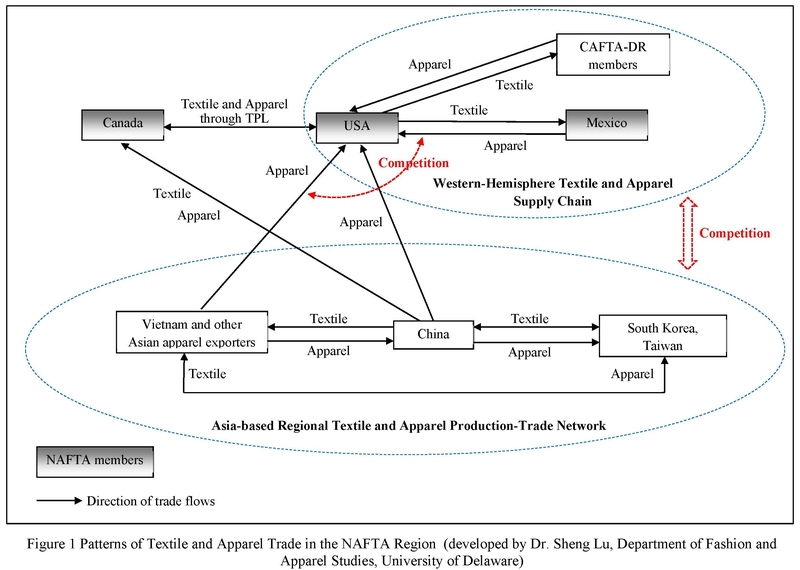 #3 What would happen to the Western-Hemisphere textile and apparel supply chain should NAFTA no longer exist? #4 Should NAFTA be responsible for the loss of US apparel manufacturing jobs? Any hard evidence? #5 If you were U.S. trade negotiators, what would you do with TPL in NAFTA given the competing views from the U.S. textile industry and U.S. fashion brands and retailers? 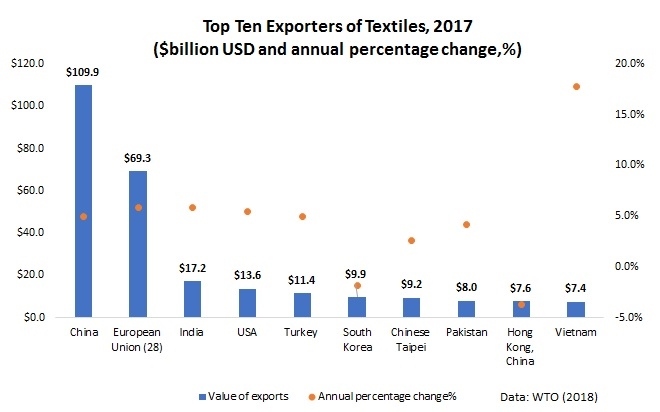 #6 From the perspective of the U.S. textile and apparel industry, is it a good idea for the United States to reach free trade agreement (FTA) with Asian countries? If so, what countries should be included in the new FTA? If not, why? #7 How can U.S. companies get involved in the Asia-based textile and apparel supply chain? #8 Why or why not is the “Flying geese model” unique to Asia? Can the model be replicated in America too?